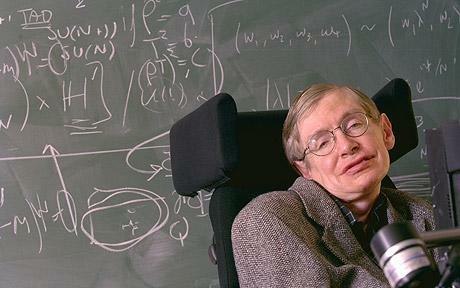 To those who does not know who is Stephen Hawking, below image will make things a little bit clear. This is what Wikipedia says about him: Stephen William Hawking, CH, CBE, FRS, FRSA (born 8 January 1942) is a British theoretical physicist, cosmologist, and author. Among his significant scientific works have been a collaboration with Roger Penrose on gravitational singularities theorems in the framework of general relativity, and the theoretical prediction that black holes emit radiation, often called Hawking radiation. Was diagnosed with motor neuron disease at age 21. "At school, I was never more than about halfway up the class. It was a very bright class. My classwork was very untidy, and my handwriting was the despair of my teachers. But my classmates gave me the nickname Einstein, so presumably they saw signs of something better. When I was twelve, one of my friends bet another friend a bag of sweets that I would never come to anything. I don't know if this bet was ever settled, and if so, which way it was decided..."
From the lecture "My Brief History," 2010. From Into the Universe with Stephen Hawking, 2010. From a lecture at Arizona State University, April 2011. "If you are disabled, it is probably not your fault, but it is no good blaming the world or expecting it to take pity on you. One has to have a positive attitude and must make the best of the situation that one finds oneself in; if one is physically disabled, one cannot afford to be psychologically disabled as well. In my opinion, one should concentrate on activities in which one's physical disability will not present a serious handicap. I am afraid that Olympic Games for the disabled do not appeal to me, but it is easy for me to say that because I never liked athletics anyway. On the other hand, science is a very good area for disabled people because it goes on mainly in the mind. Of course, most kinds of experimental work are probably ruled out for most such people, but theoretical work is almost ideal. My disabilities have not been a significant handicap in my field, which is theoretical physics. Indeed, they have helped me in a way by shielding me from lecturing and administrative work that I would otherwise have been involved in. I have managed, however, only because of the large amount of help I have received from my wife, children, colleagues and students. I find that people in general are very ready to help, but you should encourage them to feel that their efforts to aid you are worthwhile by doing as well as you possibly can." From "Handicapped People and Science," Science Digest 92, No. 9, September 1984. "I would go back to 1967, and the birth of my first child, Robert. My three children have brought me great joy." To the New York Times, May 2011. From Black Holes and Baby Universes and Other Essays. To Diane Sawyer/ABC News, June 2010. "Next time someone complains that you have made a mistake, tell him that may be a good thing. Because without imperfection, neither you nor I would exist." "I have no idea. People who boast about their I.Q. are losers." To the New York Times, December 2004. To the New Scientist, January 2012. The limited edition Ferrari, you can't buy !